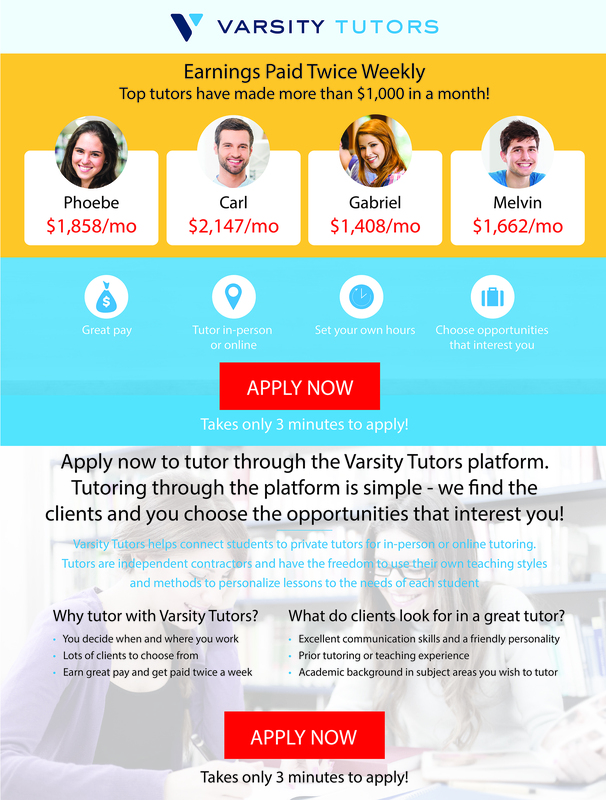 Varsity Tutors is recruiting for private tutors across all subjects and test prep. Tutors have the convenience of working with students in-person or online, and are paid twice a week. Work as a private tutor today! Learn more and start earning! Tutoring opportunities include: ACT, SAT, Spanish, Physics, Chemistry, Calculus, Algebra, Mandarin Chinese, Statistics, Geometry, Algebra Tutor, Elementary Math, Elementary School Subjects, Middle School Subjects, High School Subjects, College Subjects, Precalculus, Stats Tutorials, Trigonometry, Math, Science, Accounting, Advanced Placement, AP coaches, Anatomy, Biology Instructor, Chemistry Instructors, Computer Science Teachers, Economics, Engineering, English Teacher, ESL, EFL, Finance, French lesson, German lessons, GMAT, GRE, History, HSPT, International Baccalaureate courses, IB Class, Part-Time Classes, ISEE, Japanese Instruction, Latin coach, LSAT, MCAT preparation, Organic Chemistry, Biochemistry, Phonics Assistant, Physics Professors, PSAT, Reading tutorial, SSAT, TACHS, Test Prep, Writing Professor, Computer Science course, Online Subjects, Part Time Tutors, Special Education. Professional Certification Exams including: CFA, CPA, USMLE, Bar Exam, Exam P-Probability, Exam FM-Financial Mathematics, Exam IFM-Investment and Financial Markets, Exam LTAM-Long-Term Actuarial Mathematics, Exam STAM-Short-Term Actuarial Mathematics, Exam SRM-Statistics for Risk Modeling, Exam PA-Predictive Analytics, CIMA, CFP, CAIA, FRM, SIE, NBDE, DAT, PCAT, OAT, COMLEX, PMP, Certified ScrumMaster, Six Sigma, Series 3, Series 5, Series 6, Series 7, Series 11, Series 15, Series 17, Series 22, Series 30, Series 31, Series 32, Series 37, Series 38, Series 42, Series 44, Series 47, Series 52, Series 55, Series 56, Series 57, Series 62, Series 63, Series 65, Series 66, Series 72, Series 79, Series 82, Series 86, Series 87, Series 99, Series 4, Series 9, Series 10, Series 12, Series 14, Series 14A, Series 16, Series 23, Series 24, Series 26, Series 27, Series 28, Series 39, Series 51, Series 52.